The BFI played SALOME and WILDE SALOME in a double bill followed by a Q&A led by Stephen Fry with Al Pacino and Jessica Chastain. What follows is thus a combined review of all three events. SALOME is Al Pacino's passion project of complex origin and it stubbornly defies categorisation. It began as a project to both put on a theatrical revival of Oscar Wilde's play directed by Estelle Parsons but clearly heavily influenced by Al Pacino in the lead role of King Herod, but also in the role of film-maker, for he simultaneously directed a film version of the play (SALOME) as well as a documentary of the making of the film and play (WILDE SALOME). To say that the resulting movies are operating on many meta levels is an understatement. This is all made more complex by the fact that the theatrical production wasn't a full staged production but rather something of table reading in costume. Although clearly the actors were not using the "book" to guide them but acting the lines off book. That decision, its ramifications and reasonings, was behind some of the hostile reviews the show received. To add to the confusion, Pacino isn't filming the play at the theatre, but rather re-creating it each day on a soundstage before the play takes place back at the theatre each night. It's a gruelling schedule, and one that clearly took its toll. So let's start with the play, Salome. Oscar Wilde tells the familiar tale of Herod's lust for his chaste stepdaughter and niece Salome, her genuine but rejected love for John the Baptist, and her subsequent transformation into seductive woman exploiting her uncle's lechery to exact the death of the prophet that scorned her - a man so transparently holy that even the dissipated Herod can recognise the danger in killing him. It's a play that is unlike anything else that Wilde ever wrote - there aren't any witty aphorisms and it is resolutely a play about SOMETHING in sharp contrast to Earnest. The lush language - heavy use of layered repetition and doom-laden confrontation - maybe stems from Wilde trying to understand his own irrational love for Bosie - the callow boy who endangered and rejected him - and the inevitable tragedy of submitting to such passion. It's a play that few forget who have ever seen it - a play that can transcend many varieties of interpretation and production. In the Estelle Parsons production, filmed for SALOME, the play is pared back so far that it is the words that absolutely command our attention. The actors remain on stage, except for the odd flashback to a filmed banquet, largely inert except for the pivotal dance of the seven veils. It took a while to get used to the static quality and extreme artifice but soon the words and the powerful performances worked their magic. Jessica Chastain is utterly believable as the chaste girl turned vengeful lover driven insane by her passion. I was also particularly impressed by Kevin Anderson as Jokanaan - his power and purity is evident. And in the darkly comic role of nagging wife, Roxanne Hart is superb as Herodias. In fact, if anything the weak link is Al Pacino, whose performance involves those linguistic ticks that descend into parody, and whose choice of accent is puzzling. Still, one cannot deny that he is superb in the pivotal final scene when even Herod is frightened by and revolted by Salome's madness. The resulting film is emotionally exhausting, as it should be - provocative, daring and challenging. It is a must see. 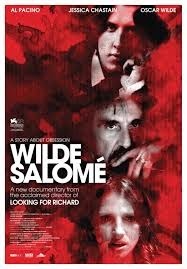 By contrast, the documentary about the making of the film and play, WILDE SALOME, is a mess - and all the more disappointing because Pacino managed to get such insightful people to talk to him - Gore Vidal, Tom Stoppard among them - but didn't give them enough space. I got the sense that Pacino didn't really know what the film was about. Was he making a behind the scenes documentary about putting on the stage play and then filming it? Was he making a documentary about his personal response to the play? Was he making a film about the life of Oscar Wilde and how it fed into the play? The fact is that all of these strands rub up against each other in a documentary that feels crowded, disorganised and, in truth, like a vanity project. We get a little of the mayhem in putting on both play and film. We don't really understand the choices to do a table-read or behind Pacino's accent. Only Jessica Chastain is allowed to explain a little of her method. We get glimpses into Wilde's great life and work but very little of Pacino's journey through it. In fact, for a man who allows himself to look rather grumpy and demanding in the doc (something he admitted in the Q&A that he played up for the cameras) we can very little of his internal response to Wilde at all. The result is a mish-mash - too heavily reliant on extended excerpts from the play - and thus redundant alongside it. I would frankly have rather heard the eloquent Stephen Fry discussing the play for 95 minutes than this. SALOME has a running time of 81 minutes and is rated R.
WILDE SALOME has a running time of 95 minutes and is rated R.